As a golf-consumed child growing up in Northern California, Joseph Bramlett openly admired Tiger Woods. Joseph Bramlett drew attention at a young age. When Bramlett was 10, John Kennaday -- who was the Santa Clara golf coach at the time and now leads San Jose State -- offered him a scholarship to wherever he was coaching when he was ready for college. Bramlett and his father, Marlo, traipsed around Stanford Golf Course when Joseph was 7 or 8 to watch Woods play in a college tournament. Not long thereafter, Bramlett plastered two posters of Woods on his bedroom wall, including one from the 1997 Masters. But what separates Bramlett from other Woods fans is the road he has traveled and the parallels he shares with the world's top player. Bramlett also comes from a multiracial family and learned the game from a devoted, disciplined African-American father. Bramlett also defied his age, becoming the youngest player to qualify for the U.S. 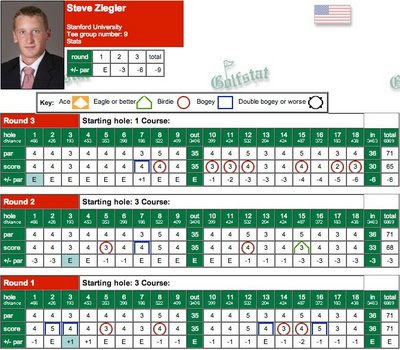 Amateur, at age 14 in 2002, and helped his college team win the NCAA championship during his freshman season (something even Woods didn't pull off). It's hardly coincidence Bramlett landed at Stanford. The school's academic prestige and proximity to his family's Saratoga, Calif., home were appealing, but it didn't hurt that Woods spent two years with the Cardinal before soaring into his otherworldly realm. "Tiger has meant a lot to Joseph as a role model and pioneer," said John Kennaday, one of Bramlett's instructors during his younger days and now the coach at nearby San Jose State. "It's a good opportunity to follow in your hero's footsteps." 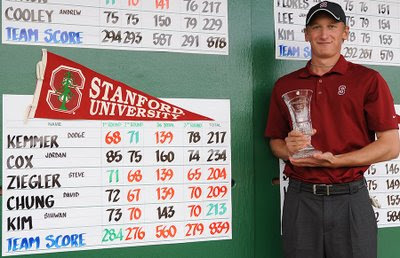 Stanford finished 19 shots back of USC in 4th place led by Steve Ziegler's 3-under 71-71-71 (T-7). The team finished 2 shots behind 3rd place TCU. Other Stanford scores were David Chung's 75-74-69 (T-15), Sihwan Kim's 74-71-77 (T-30), Dodge Kemer's 74-75-76 (T-43), and Daniel Lim's 77-80-71 (T-56). Here are full results for the event. "The 19th Annual University of Hawaii at Hilo Invitational Golf Tournament is scheduled for Wednesday, February 4 through Friday, February 6 on the Mauna Lani Resort North Course. The tournament begins with a 12:30 p.m. practice round on Tuesday, February 3. Shotgun starts will begin at 12:30 p.m. on Wednesday, 7:30 a.m. on Thursday and Friday. Joining the Vulcans in this year’s tournament are defending champion Stanford University, Arizona State University, Florida State University, Fresno State University, Georgia Tech, Texas Christian University, Texas Tech University, University of California-Davis, University of Colorado, University of Hawaii-Manoa, University of Kansas, University of Oklahoma, University of Oregon, University of San Francisco, University of Southern California and University of Washington. Defending medalist Jesper Kennegard will lead the Arizona State squad. Kennegard, a sophomore from Kippan, Sweden, has one top 10 finish in three tournaments and is averaging 71.67 strokes per round. The 18-hole "North" course at the Mauna Lani Resort Golf Course facility in Kamuela, Hawaii features 6,913 yards of golf from the longest tees for a par of 72 . The course rating is 73.2 and it has a slope rating of 136 on Bahia grass. Designed by Robin Nelson, ASGCA/Rodney Wright, ASGCA/Ray Kane, the North golf course opened in 1981."